Jack Chernus was born in 1912 in Bucharest, Romania, son of Isadore, a Jewish merchant. Chernus first matriculated at the University of Glasgow in 1934, aged 22, by which time he had emigrated to the United States of America. Chernus came to Scotland to study Medicine with the aim of obtaining a LRCP, a triple qualification, which was a licence to practice medicine granted conjointly by the Royal College of Physicians of Edinburgh, the Royal College of Surgeons of Edinburgh and the Faculty (later Royal College) of Physicians and Surgeons of Glasgow (since 1886). In the 1920s and 1930s this Triple Qualification was taken by large numbers of Jewish people who were excluded from universities in the USA and elsewhere. 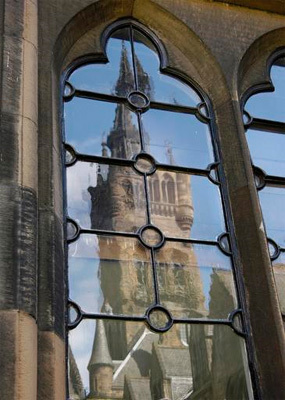 Chernus attended classes in Medical Practice at the University of Glasgow in session 1934-35. Upon his return to the USA, Chernus held an internship at St. Barnabas Hospital and residency at Trenton State Hospital in New Jersey. He became Head of Psychiatry at St. Barnabas Medical Center in Livingstone, New Jersey, and also a life-fellow of the American Psychiatric Association, writing numerous articles for journals. He moved to Sarasota, two years before his death, on 18 October 1989.